Durable layer of coating protection that greatly enhances gloss! Everything needed in one convenient package! Gyeon Syncro is a multi-layer coating system designed to enhance and protect your paint for years! Most coating manufacturers offer coatings and other separate products you can use as a topper to enhance hydrophobic properties, add some gloss, and help keep the coating layer protected and performing it's best. 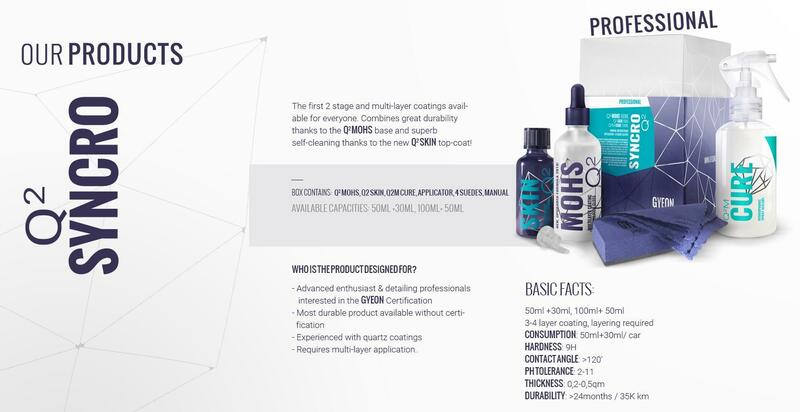 With Syncro, Gyeon has come up with an easy to use, two step coating process that includes everything from application materials, to the coating, to the topper. All of this is included in one convenient package with detailed application instructions. After thoroughly cleaning, polishing and prepping your paint, you will want to apply the included MOHS, followed by Skin and finally topped with the Cure. This three step, 3-4 layer application will greatly enhance gloss and leave you with a durable layer of protection for up to 24 months. Future cleanings will be much easier as less contamination will stick to the paint and for the dirt and grime that does, it will be easier to remove during your wash process. Gyeon does recommend that you have some experience with coatings before diving into applying Syncro, however that did not stop them from making this product incredibly easy to apply, even for weekend warriors. If you want to step up your coating game, give the Gyeon Syncro a try! 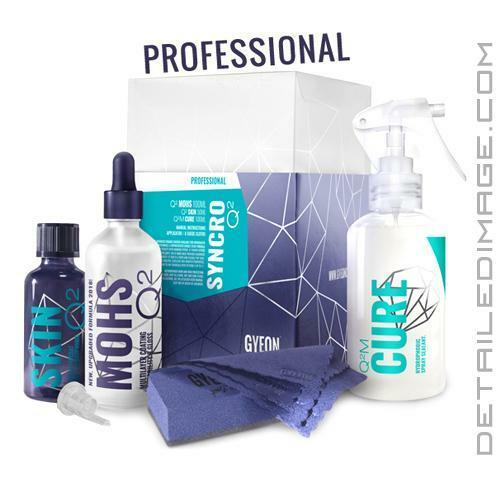 For in-depth instructions on how to use Syncro, check out the article How To: Gyeon Quartz Q2 Syncro by Jeff McEachran, the national brand manager at Gyeon USA. The most advanced ceramic coating available for enthusiasts and detailing professionals. A sophisticated double stage formula delivering great results with minimum effort. Q2M Synchro offers incredible slickness and repellency. The Q2M Mohs base provides hardness and significant durability. Q2 Skin is a thick and flexible top coat, offering great self-cleaning abilities. Excellent anti-graffiti properties. The coating is resistant to any chemicals with pH from 2 up to 11. I took the plunge and purchased this during one of the holiday sales at a good price. The previous review is more of someone's opinion based on not using it. It does cost quite a bit but it comes with a 50ml bottle of MOHS, 30ml bottle of Skin, a 3.4 oz bottle of Cure and all the essentials needed to apply it. I used it after polishing the car using Gyeon's Q2 Primer Polish which is a nice polish to work with. Jeff McEachran	of Gyeon Quartz USA has a great write up in the Ask a Pro Blog section. The MOHS in this kit is easy to work with. The instruction booklet states it can be wiped off within 10-30 seconds which makes application fast. It is easy to work with and easy to wipe off. It is forgiving. The instruction booklet also states that 2 coats of MOHS is recommended and that each coat can be applied within 1 hour. It looks good on it's own and felt slick upon initial application. After a few hours it feels a tiny bit grabby. Overall super easy to work with. Skin is the new top coat from Gyeon. This will add slickness to the base layer of MOHS among other things. I can attest that it leaves the surface slick as soon as it is wiped off. The surface feels like a freshly waxed or freshly sealed paint surface. The instruction booklet states it can be applied and wiped off immediately. I wiped it off about 20-30 seconds after application. Again this is just as forgiving as MOHS if not a little more. It goes on effortlessly and is super easy to work with. One thing that Gyeon states in the instruction booklet is that there is a 4 hour window prior to applying Skin on top of MOHS. Also only 1 coat is recommended. Overall the kit is easy to work with. Too early to tell if it is worth it based on the performance of the coating. But the overall look is great as is the ease of application. Also it is a lot of work and takes patience. So for those that do not then this may not be the product for you. As far as durability 24 months is about right. The paint surface gets dirty and by then it is time to repolish and recoat. The thing is to know the limitations of a coating. As far as my initial thoughts, I would recommend it. 3-4 coats and good up to 24 no? Are you out of mind. Nothing special about this for the durability and price.